Released today on Steam for free by Five Nights at Freddy’s creator Scott Cawthon, Freddy Fazbear’s Pizzeria Simulator is an old-school arcade game in which a bear tosses pizzas at hungry children. Or at least that’s how it starts. Cawthon’s been teasing the new game on his website, and here it is. Using simple WASD controls, players move the bear mascot around the screen, picking up pizzas and throwing them across the screen to the waiting children. It’s pretty basic, but it does come with a fancy pizza designer feature. The first couple of rounds are easy. Then an obstacle appears. Then ... stuff happens. If you’d rather experience that stuff for yourself, head over to Steam and grab a copy. This is your spoiler warning. Heed the spoiler warning, lest you be spoiled. Yeah, there’s no way Scott Cawthon would release a simple 8-bit arcade game and call it a day. Once the “obstacle” level is conquered, the game glitches out, and things change. Following a brief audio test of sorts, a cheery animation plays. A warm, friendly voice welcomes players to the world of franchise ownership. They’re building their own Freddy Fazbear’s Pizzeria from the ground up, and should they cut some corners and accidentally invite murderous evil into their establishment, why that’s all part of the fun. Players start off with a small amount of cash to buy some decorations and basic animatronics. We’re talking a pail with a broom handle and face painted on it. Maybe a ball pit. Some of the decorations might might seem a little evil, but that’s only because they are. Once supplies are purchased, players slip into blueprint mode to set everything up. 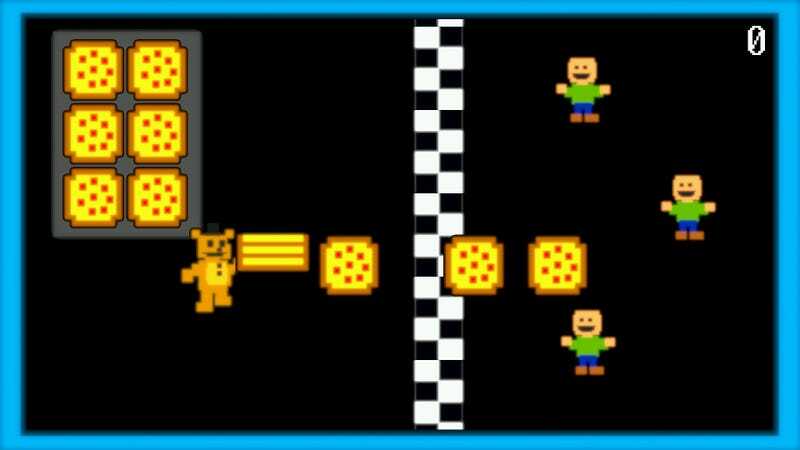 They better their setup, the more “Fazbear Points” they score, raising their revenue. Once everything is in place, it’s time to open for business. As the manager of the location, the player spends the day in the office, performing tasks like ordering supplies, cleaning toilets and making sure the AC isn’t too loud to hear anything crawling through the vents on either side of their work desk to kill them. Should they survive the day, it’s home for a nice cup of coffee, but not before salvaging the twisted animatronic animals that mysterious appear in the alley behind the restaurant. Harvesting these can bring in extra revenue, or unleash unspeakable terror into the building, making the next day’s office manage duties just a little more dangerous. So this stupid little 8-bit arcade joint blossoms into an evil restaurant tycoon game. It’s quite clever, the way the management game melds with a more traditional Five Nights experience. For example, players can accept sponsorships for a quick influx of cash, but boy is it hard to hear things crawling through the vents in the management office when the sponor’s loud video ad starts to play. The arcade games players purchase and place in their pizzerias are playable. I am not good with jumpscares, and Freddy Fazbear’s Pizzeria Simulator has already given me a couple. If my nerves were solid enough to play a Five Nights at Freddy’s game, this would be the one for me.